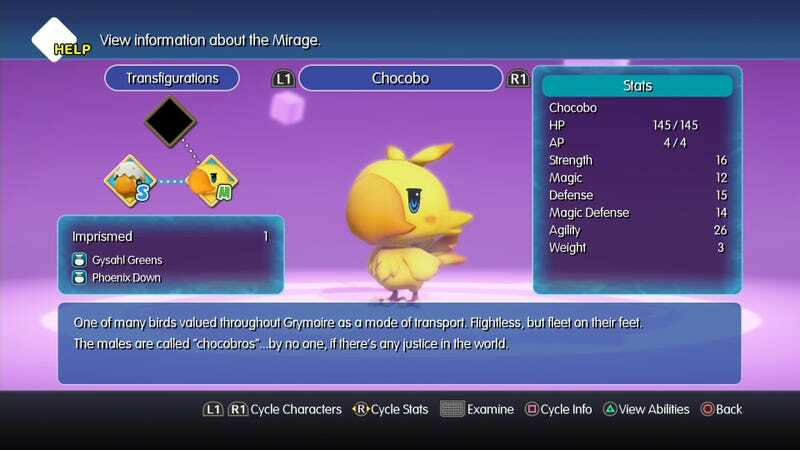 One of the best reasons to collect all of the mirage creatures in World of Final Fantasy is to fill out the Mirage Manual, a catalog of creatures with some very colorful flavor text. Here are some of the best to get you started. The Mirage Manual can be found in Lann and Reynn’s room in time-displaced Nine Wood Hills. The game system near the window gives players access to a character catalog, the Mirage Manual and a selection of mini-games unlocked as the game progresses. In a world devoid of other people, these two share a room. Both the Who’s Who catalog and the Mirage Manual give players extensive information on the creatures and characters encountered on their adventures. Both also allow players to change backdrops, play special animations and take glamour shots of their favorite in-game models. The Who’s Who is particularly handy, containing biographical information, voice actor info and a full accounting of what each character is doing in the world of Grymoire. But it’s quite spoiler heavy, so we’ll focus on those creatures and their silly flavor text. All creatures great and small get entries in the Mirage Manual, from player companion Tama, who may or may not smell like rainbows . . .
To the next stage beyond the Ultima Weapon, which as it turns out was a bit tricky to name. At least more difficult to name than good old Omega. Written in the voice of Serafie, the sardonic pixie who manages the mirages you don’t carry into battle, the flavor text is perfectly fine with referencing things Final Fantasy characters should have no business knowing about. Or acknowledging the fact that this is a video game. Or specifically one of many Final Fantasy video games. Sometimes the descriptions reference sticking points in franchise fandom, like the Moogles being made into mailmen in Final Fantasy IX. They also reference other Final Fantasy creatures with similar names. But the descriptions are at their best when they’re just plain silly. World of Final Fantasy is now available on PlayStation 4 and Vita. It comes with Greg.